South Korea on Monday unveiled a tentative roster for the 2018 FIFA World Cup in Russia, headlined by Tottenham Hotspur attacker Son Heung-min. South Korea's head coach Shin Tae-yong announced the roster of 28 players for the World Cup in Russia, where the men's national team will face Germany, Sweden and Mexico in Group F.
South Korea are scheduled to open their Group F campaign with Sweden in Nizhny Novgorod on June 18 and will face Mexico five days later in Rostov-on-Don. The Taeguk Warriors will take on defending champions, Germany, in Kazan on June 27. Shin's preliminary squad is comprised of three goalkeepers, 12 defenders, nine midfielders and four forwards. Shin said he decided to add five more players to his World Cup list because of injured players. South Korea have already lost defenders Kim Jin-su, Kim Min-jae and midfielder Yeom Ki-hun due to injuries. 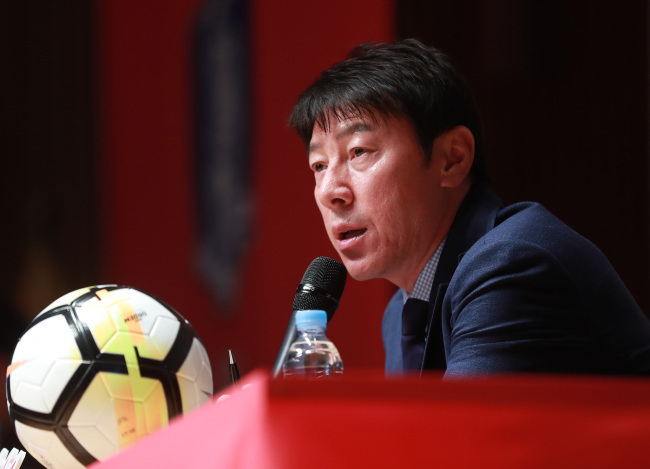 "I first wanted to select 23 players and build up our teamwork in the upcoming weeks, but because of injured players, I had to change it," Shin said at a press conference at Seoul City Hall. "I was told that Kim Min-jae and Yeom Ki-hun have to be sidelined for eight to 10 weeks. As for Kim Jin-su, he can jog at the moment, but I will have to decide whether he can stay with us after watching him in our training." Half of the 28 play in the domestic K League, four of them for defending champions Jeonbuk Hyundai Motors. The list also includes a handful of Europe-based players like Son, Ki Sung-yueng of Swansea City, Kwon Chang-hoon of Dijon FCO, Hwang Hee-chan of Red Bull Salzburg and Koo Ja-cheol of FC Augsburg. Ki, who is expected to wear the captain's armband, is the most experienced on the roster with 99 caps. There were also some surprise selections: Lee Seung-woo of Hellas Verona, Moon Seon-min of Incheon United and Oh Ban-suk of Jeju United. All three have been named to the senior national team for the first time. "These three players never played for us, but they can also go to the World Cup if they give impressive performances with us (in the upcoming tune-up matches)," the coach said. Lee, 20, is the youngest player on the roster. The former FC Barcelona youth team forward is 13 years younger than the team's oldest player, Lee Keun-ho. Shin will have to drop five players before his side competes at the World Cup. According to FIFA, the deadline to submit the final list of 23 players is June 4. The 49-year-old coach said he will confirm the final roster by June 3. "I have to change my original plan due to injured players, but we still have four weeks to prepare for the tournament," he said. "I will try to strengthen our defense line and will build cohesion with new players in the upcoming weeks. For the final roster selection, I will first consider those who make sacrifices for the team." Shin's squad will begin training at the National Football Center in Paju, Gyeonggi Province, on May 21 to prepare for their two World Cup tune-up matches at home. South Korea will face Honduras in Daegu on May 28 and will take on Bosnia and Herzegovina in Jeonju, North Jeolla Province, on June 1. Shin's team will then fly to its pre-World Cup training camp in Austria to play against Bolivia on June 7 and Senegal on June 11. The South Koreans will enter their World Cup base camp in St. Petersburg on June 12. "About 50 players have played in South Korea's World Cup qualifiers and I feel rather sad that nearly half of them are not on the list," he said. "Some people have said that we'll have three losses at the World Cup, but I want to return home after having a 'delightful rebellion.'"